Now is your turn to directly experience the amazing benefits of the Enlightenment Transmission and find out why others are so enthusiastic. First come, first served! Free entry. Let me know that you are coming, I'll prepare a spot for you! An Enlightenment Transmission happens when there is a connection between a person’s inner Self and their everyday self. This phenomena is pleasurable for others and suddenly encourages one to have personal inner connection with their deepest Self. From this enjoyable connection comes true love, life and laughter and a full connection with others. The purpose of this Introduction meeting is to share the experience of the Enlightenment Transmission, to provide an update about valuable new developments in Enlightenment Transmission Teaching, to meet interested participants both old and new and to share the deeper aspects of the Oshana Energy-Work Method. Meet Dave at this free Introduction on September 26th to learn about and prepare for mind-blowing for any of the Intensive Days in beautiful MidCoast Maine between Saturday, September 29th to Friday, October 5th, 2018 ‘Revelations: Enlightened Living, Life Mastery and Transcendental Bliss (Maine)’. * Contact Enlightenment Transmission USA. 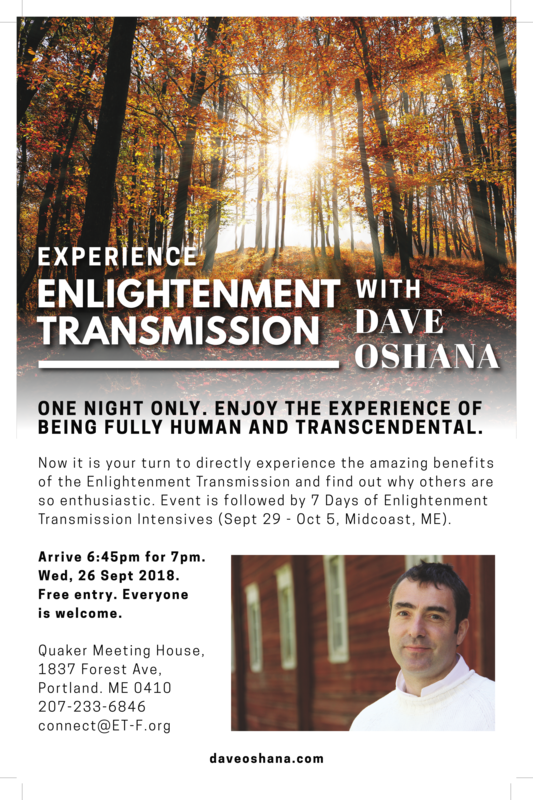 Excited to be back on the fresh ocean shores of Maine, Enlightened spiritual teacher Dave Oshana will share the exceptional Enlightenment Transmission to a public audience of hungry spiritual seekers. The Enlightenment Transmission is not like anything you have ever encountered. What has been repeatedly observed is that around it, people experience increased energy, awareness and ability to tune into one’s true life mission. The Enlightenment Transmission is not a technique or method. Its highly transformational and effective results do not depend upon your own personal efforts. There is nothing to practice. Instead you will find yourself spontaneously more present and blissful. This meeting will not be like an ordinary meditation. No ‘self-discipline’ is required. You simply show up. Dave then silently works with every person in the room to take them further along their spiritual path to self-realization. Dave will also share his own experiences, firstly as a pre-Enlightened spiritual seeker and then as an Enlightened spiritual teacher. His approach is warm, friendly, accessible, often humorous and always personal. He follows no tradition or teacher except the Enlightenment Transmission. If you have been spiritually seeking on religious and spiritual paths, you will find Dave’s Enlightenment Transmission worthy of your attention and participation. This may be a once in a lifetime opportunity to meet an authentic Enlightened spiritual teacher and experience spiritual reality as directly revealed by the Enlightenment Transmission. 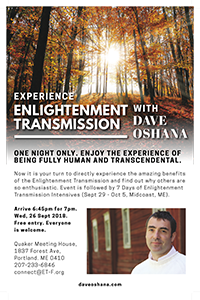 Finally, meeting Dave at an introductory event such as this is the best way to fulfil the preparatory eligibility requirements for deeper and more profound exposures to the Enlightenment Transmission, such as Enlightenment Transmission Intensives and Retreats in several countries. All details can be found at DaveOshana.com/Events. Arrive 6:45pm. Seating is limited. Doors will be shut when lecture starts. Meet Dave and announce your name and intentions. Sign up on the spot for the upcoming Enlightenment Transmission Intensives and possible local One-on-One session. Talk to Oshana Enlightenment Transmission event participants. An Oshana Enlightenment Transmission teaching event is a jump into the unknown, far beyond the mind, to experience a life without limitation.